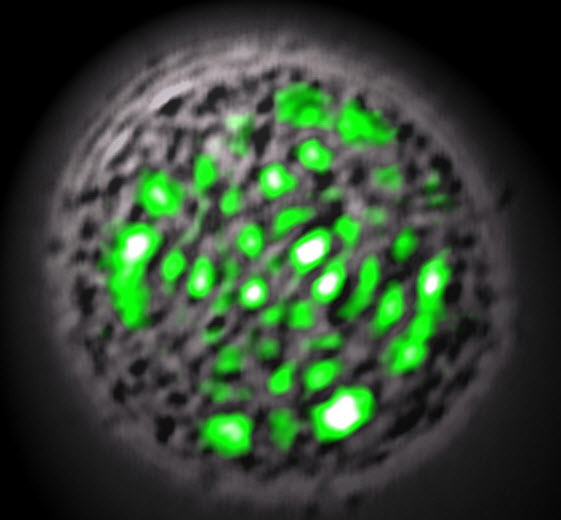 Microscope image showing green laser light shining from a single biological cell (credit: Malte Gather). The world’s first biological laser has been developed by physicists Malte Gather and Seok-Hyun Yun of Harvard Medical School. Built into a single cell, the laser might one day be used for light-based therapeutics, perhaps killing cancer cells deep inside the body. The biolaser uses a green fluorescent protein (GFP). The researchers used cells derived from a human kidney, adding the DNA that codes for GFP. The researchers then placed some of the cells producing GFP between two mirrors just one cell’s width apart. They then pumped the GFP with another laser, one that sends pulses of blue light. Inside the tight cavity, the light bounced back and forth, amplifying the emission from the GFP to a coherent green beam, the researchers report online today in Nature Photonics. The biolaser could one day help optical communications to shift from inanimate electronic devices to biotechnology. This would make it easier to develop direct human-to-machine interfaces, in which a brain’s neurons signal their operation with flashes of laser light, to be captured by an exterior device. Such an advance might enable disabled people to use computers without a mouse or keyboard, for example. With biolasers, cells can continually make new GFP. “We might be able to make self-healing lasers,” Gather says.